We mentioned the report over the weekend of Bills FA LB Arthur Moats making a free agent visit to Pittsburgh today (Monday). Now there are reports he’s agreed to a one-year deal with the AFC North club. That according to Pro Football Talk, which is reporting it to be a one-year deal for Moats. This may already be out there but the Steelers are signing LB Arthur Moats to a one-year deal. The Bills have signed a pair of free agent linebackers this month, but Arthur Moats is still out there and he’s drawn interest from an AFC North team. According to the Pittsburgh Tribune Review Moats will visit with the Steelers on Monday. Moats reportedly drew some interest from Cleveland earlier in free agency. 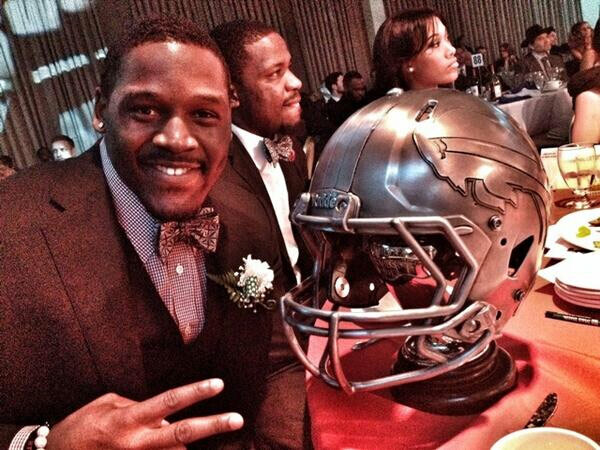 After being named the Bills 2013 Ed Block Courage Award recipient in December, Arthur Moats and his fellow award winners representing each NFL team were honored Monday night in Baltimore. The Ed Block Courage Award is presented to a standout player who exemplifies a commitment to the principles of sportsmanship and courage. The recipient symbolizes professionalism, great strength, dedication and serves as a community role model for others. Moats recovered from sports hernia surgery in the 2013 offseason, and went on to start in a career-best 12 games in 2013 as an inside linebacker. Off-the-field, he is the consummate player philanthropist. 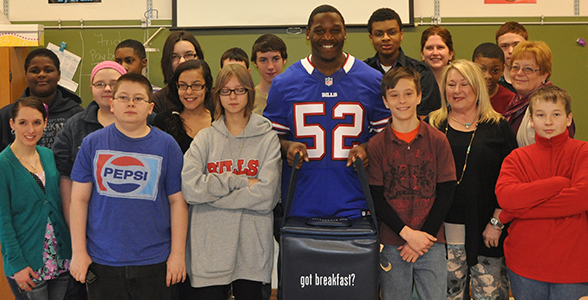 He was named the 2013 Bills Walter Payton Man of the Year as well, for both his on- and off-the-field efforts. Past Bills recipients of the Ed Block Courage Award are listed here. The Bills gave up a season-high 189 kick return yards on just four returns Sunday. Head coach Doug Marrone tried to explain what went wrong on the two returns by LeGarrette Blount that went for 83 and 62 yards right after Buffalo touchdown drives. Marrone said it’s been difficult to get consistent core of special teams players assembled under special teams coordinator Danny Crossman. Arthur Moats is back practicing here on Friday. The linebacker was excused from Thursday’s practice to handle a personal matter, but is back working on the field today. He’s expected to play Sunday. Bills LB Arthur Moats was not in attendance at practice Thursday and head coach Doug Marrone explained why. Marrone said Moats was excused for personal reasons. So the linebacker’s absence was non-injury related. The Atlanta Falcons have lost eight of their last nine games including the last five in a row. They currently sit at 2-9 on the season and were the first NFC team eliminated from playoff contention. The Bills however, aren’t thinking they can just show up and win on Sunday. Bills LB Arthur Moats has reportedly been fined for his facemask penalty on Patriots WR Julian Edelman last week. According to the Boston Globe’s Ben Volin, Moats was docked $7,875 for the facemask penalty, which came on a punt return by Edelman in the first quarter. Moats was flagged for a 15-yard penalty on the play. Bills ILB Arthur Moats did not win a starting job out of training camp at one of the two inside linebacker positions. Those belonged to Nigel Bradham and Kiko Alonso. But in Sunday’s opener, Moats got more snaps than some may have anticipated. It may have just been a byproduct of the defensive packages defensive coordinator Mike Pettine had in Sunday’s game plan, or the fact that New England’s offense was on the field for 89 plays, but Moats got 24 snaps to Bradham’s 19. While the difference in playing time is negligible, it’s probably more playing time on defense than most expected for Moats heading into the season. Moats had three total tackles, including one for loss. Bradham had one tackle and a pass defensed. Both Moats and Bradham got 19 snaps on special teams. Bills linebacker Nigel Bradham and Arthur Moats sit atop the snap count board for defensive players thus far this preseason. Here’s a look at the linebacking corps and the action they’ve seen through the first three preseason games. Here’s where you can find a certain Bills linebacker Monday morning. Arthur Moats will be on Kiss 98.5 with Janet and Nick Monday morning at 8:30 am. The Bills are just firing up OTAs and players will be on the local airwaves to talk about it this morning. Eric Wood will be on WGR 550 at 7:30 am this morning on the Howard Simon show. Arthur Moats will be on WCMF 96.5 FM at 7:45. With his characteristic energy and positive attitude, Bills linebacker Arthur Moats went out in the community today to congratulate the kids at North Park Middle School in Lockport on their school-wide engagement in a Fuel Up to Play 60 initiative. Local dairy farmers, through the American Dairy Association and Dairy Council, awarded Moats’ visit for the school’s participation in the Breakfast in the Classroom program. While at the school, he observed the program first hand and spoke to the students, reinforcing the importance of eating breakfast. He also met with teachers to commend them on being positive role models in helping their students work towards overall wellness and academic success. In addition to the loss to the Seahawks Sunday, Buffalo also lost a couple of special teams players in the game. Arthur Moats was carted off the field in the first half after a kickoff play. Marcus Easley was also injured on special teams. Head coach Chan Gailey provided an update in his weekly appearance on WGR Sportsradio 550. Moats did have the left ankle immobilized after the game Sunday night. It’s expected that the Bills head coach will provide an update at his afternoon press conference at 3:30. Bills LB Arthur Moats has been getting snaps at defensive end the past two games and according to head coach Chan Gailey that will continue. With Chris Kelsay going to injured reserve Wednesday, Buffalo has three true healthy defensive ends in Mario Williams, Kyle Moore and Shawne Merriman. Mark Anderson sounds as though he’s still a week away from returning to the lineup, so Moats remains in the mix.